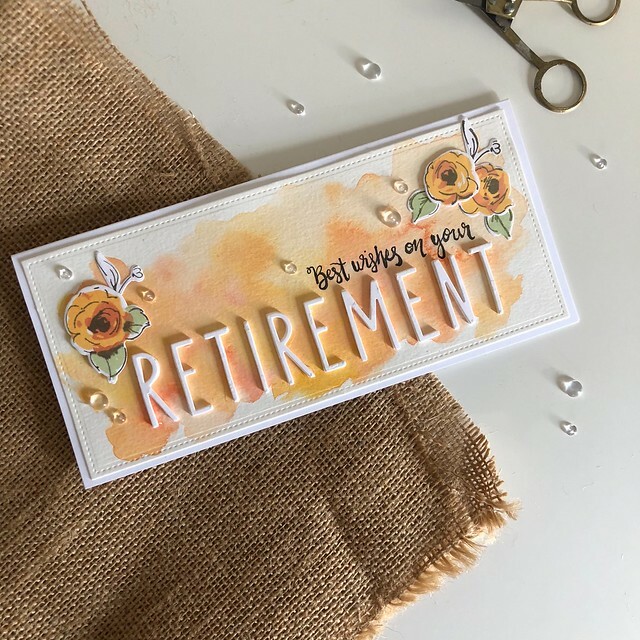 I was recently commissioned to make a retirement card that looked just like this one I made a few years ago. This time, we went for a more Autumnal color scheme, but kept just about everything else the same. I started with a watercolor background in a combination of orange, yellow and red tones. 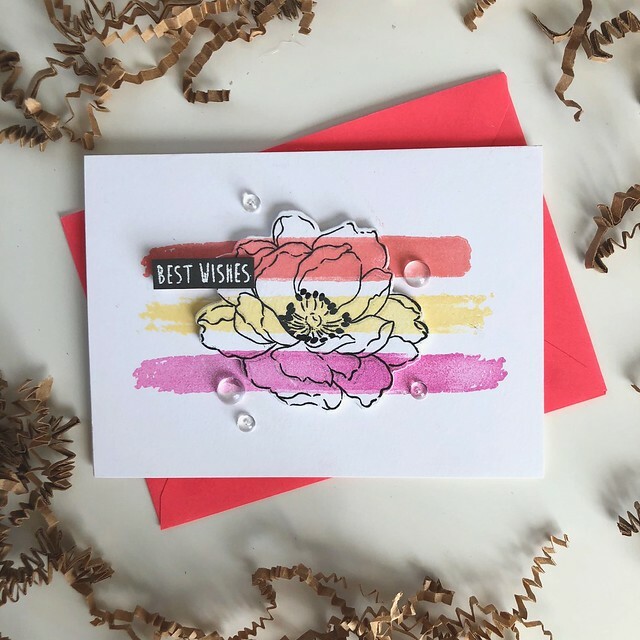 I then stamped out some Painted Flowers in ink colors that were about the same tone. This was a lot of trial and error and I tried a lot of ink colors until I got a combo that I liked. Phew! 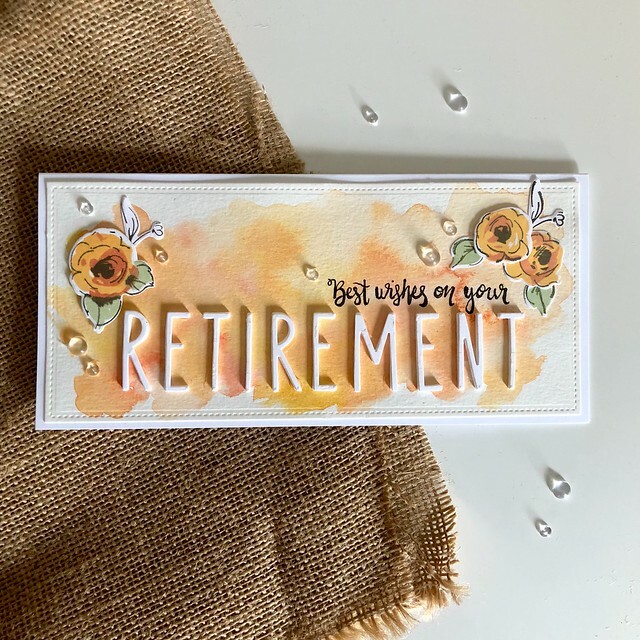 The sentiment is a combination of some hand-lettering I did and the spelling out of the word Retirement (which meant this card had to be an oblong size, about 4.5″ x 8″) using Neat & Tangled Journaling Alpha dies (a favorite die set of mine!). I like how it turned out! And it shows me that re-visiting a card style again is a really good exercise in creativity. Even though the design elements are essentially the same, I was able to tweak a few parts and practice my lettering, which is never a bad thing. I might even like this second attempt better than the first! It’s been a while! I’ve been in a serious card-making rut, but I did manage to make this going-away card for a friend recently. 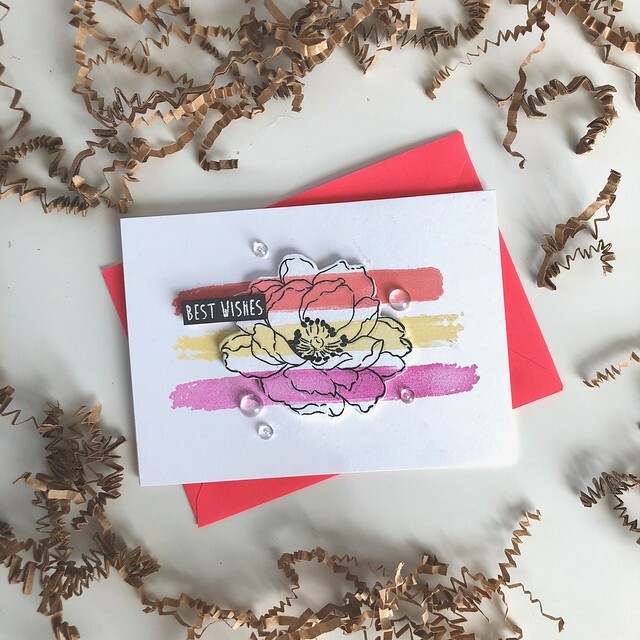 The design is inspired by one of the many gorgeous cards made by Natasha Valkovskaya who has a wonderful instagram account that you should check out! 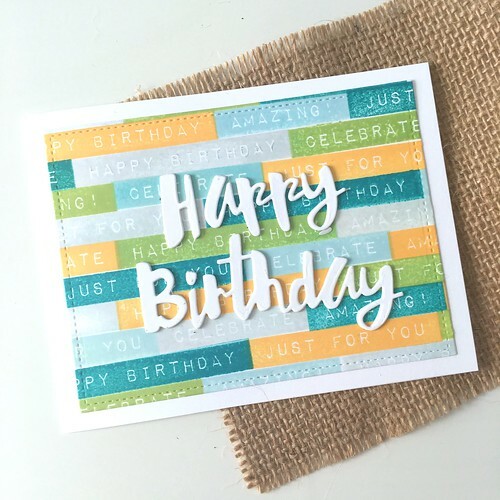 I’ve seen her use the technique of stamping stripes over an image and then die-cutting it and popping it up on some dimensional foam, so that’s what I did here. 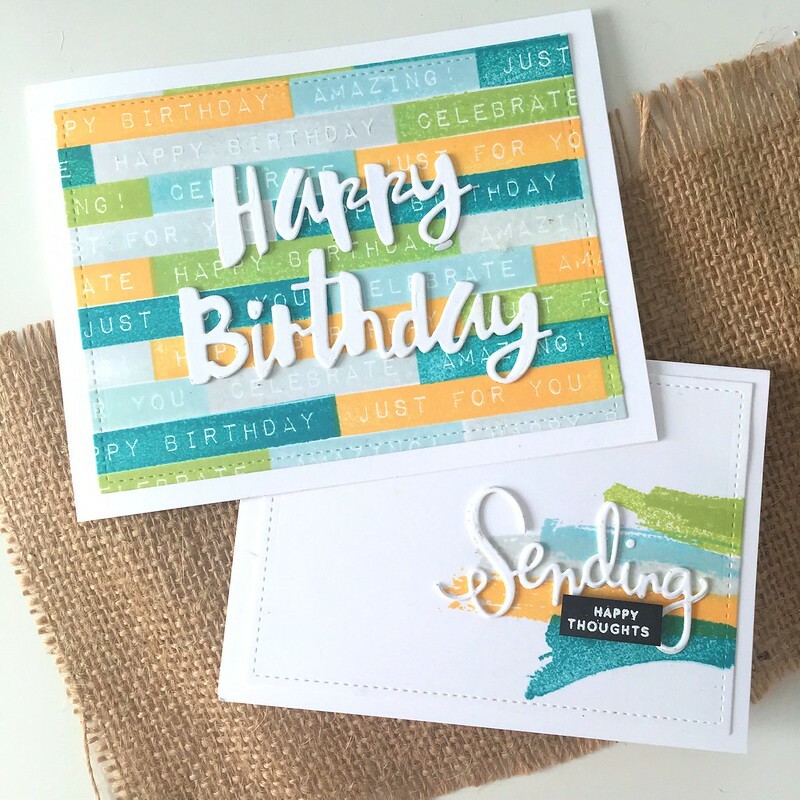 I’ve seen many other great card makers use this technique, too. It’s a great one! 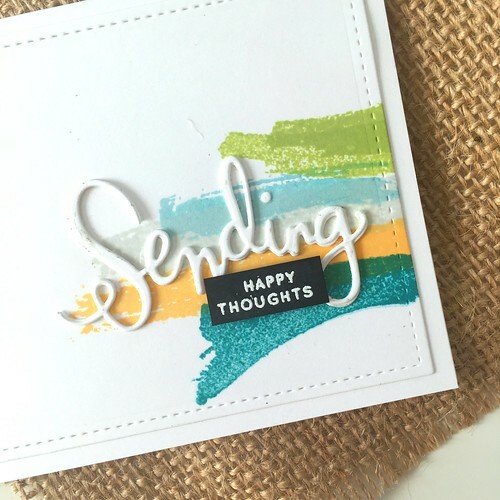 I used a large outline bloom from Altenew’s Beautiful Day stamp set. I used images from Mama Elephant’s Brush Strokes set for the brush-stroke lines across the image. 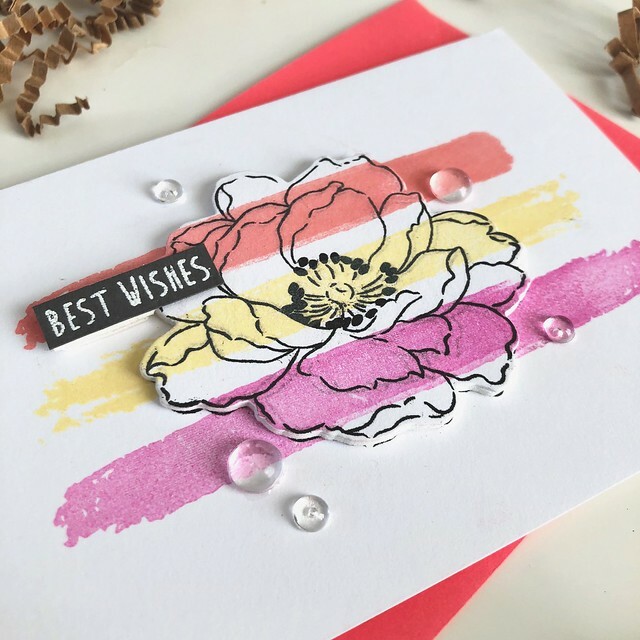 I stamped the lines using Apricot, Buttercup and Tutti Fruity pigment inks. The best wishes sentiment came from the SSS Birthday Farm Animals stamp set. I’m sure there’s a name for this particular technique, when background-meets-focal-point, but I can’t seem to figure it out at the moment. If you know what it’s called, or have an idea of what to call it, let me know! I know many people have used this technique before. Someone I’ve managed to start a tradition of baking cookies and making paper gifts to give to the people who work in my department every Christmas. In the past, I’ve made cookie boxes, pretty tags and little jar-topper villages (like these). This year I kept it pretty simple, baking up 7 kinds of cookies with my mom (!!) 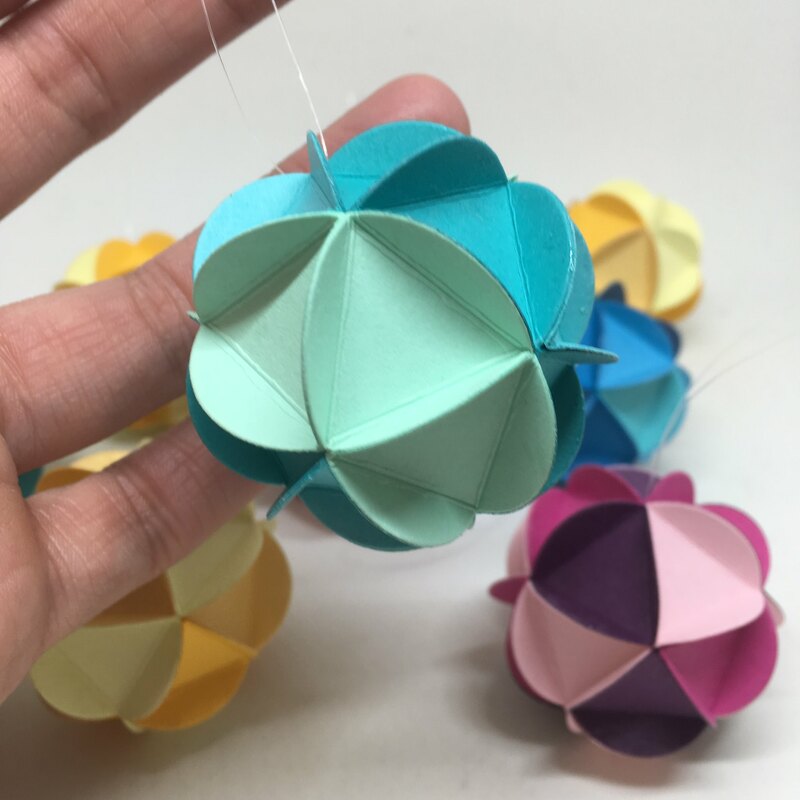 and making a paper ornament to go along with each cookie jar. 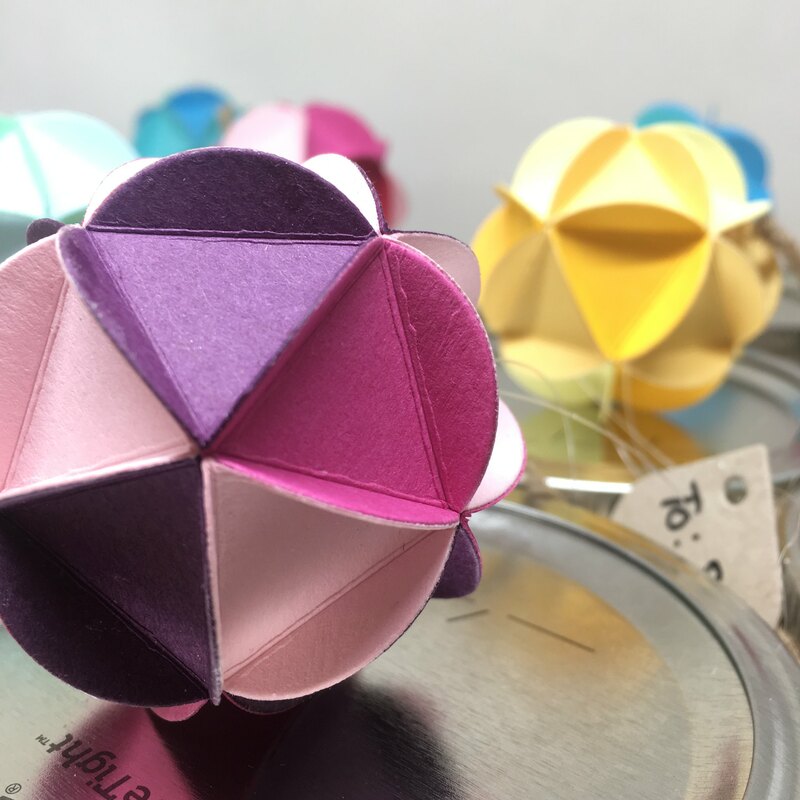 I made about 11 of these little ornaments, the shape of which I learned from one of my incredibly smart co-workers is called an icosahedron! He’s been reading a book on recreational math, nbd. 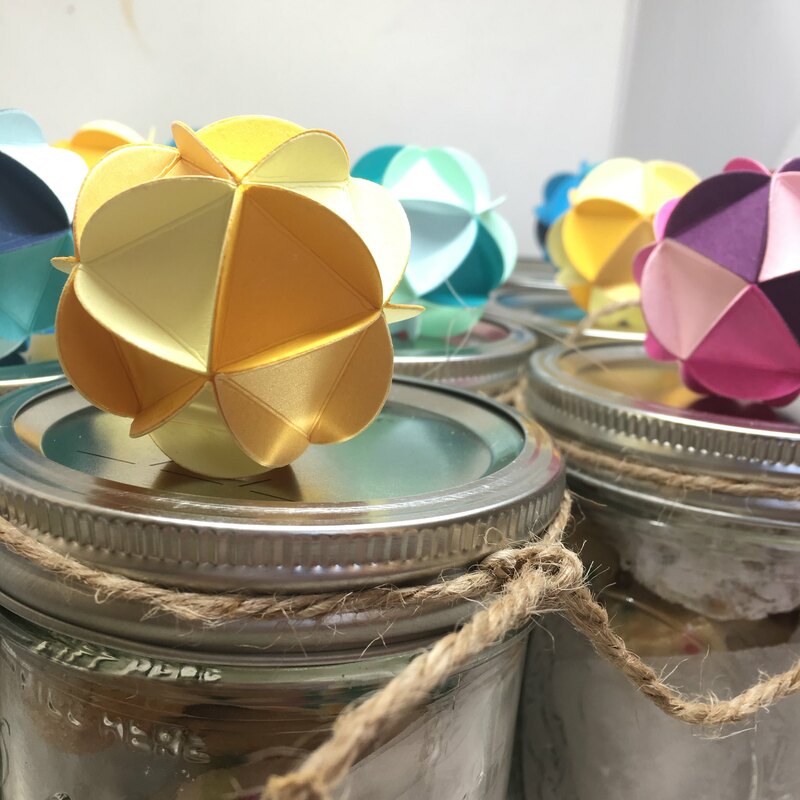 I made these using the 3D circle ornament die from Altenew and lots of colored card stock from the scrap heap I have in my craft room! 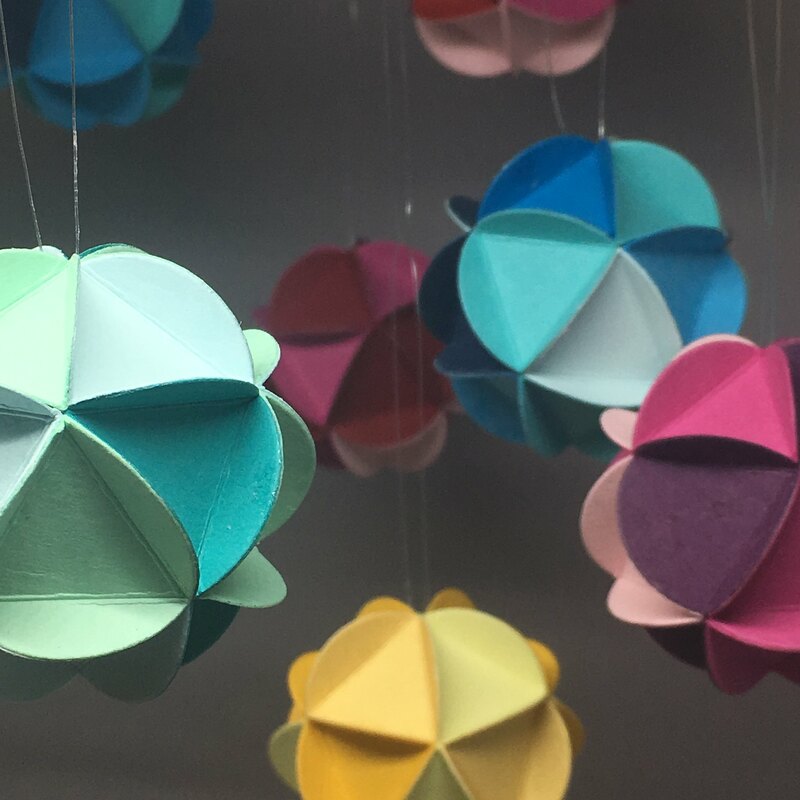 I die cut, and die cut, and die cut those little circles out for what seemed like forever, and scored, and scored, and scored and then glued, and glued, and glued! I ended up using Glossy Accents glue to glue them all together-this worked the best for me because it’s a super strong adhesive and also dries quickly enough that I could keep my assembly line moving at a good clip (but at the same time gave me a few moments to move the paper around to line everything up before the glue was totally dry). Basically, I prefer a liquid glue for this, instead of double sided tape or tape runner. But user beware: by the time I was finished my fingers were COVERED in glue! 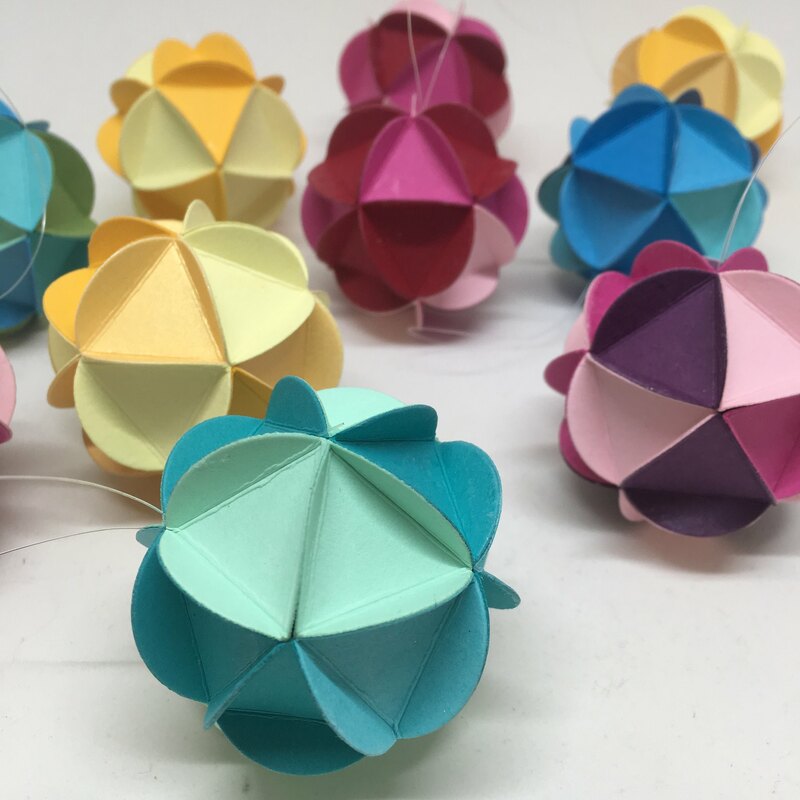 I made all of these ornaments in the smaller size. I might make a few in the larger size, if I’m feeling ambitious. I used fishing line on each ornament to give them something to hang by. I just made sure to glue the fishing line string into the top half of the ornament before I sealed everything up. 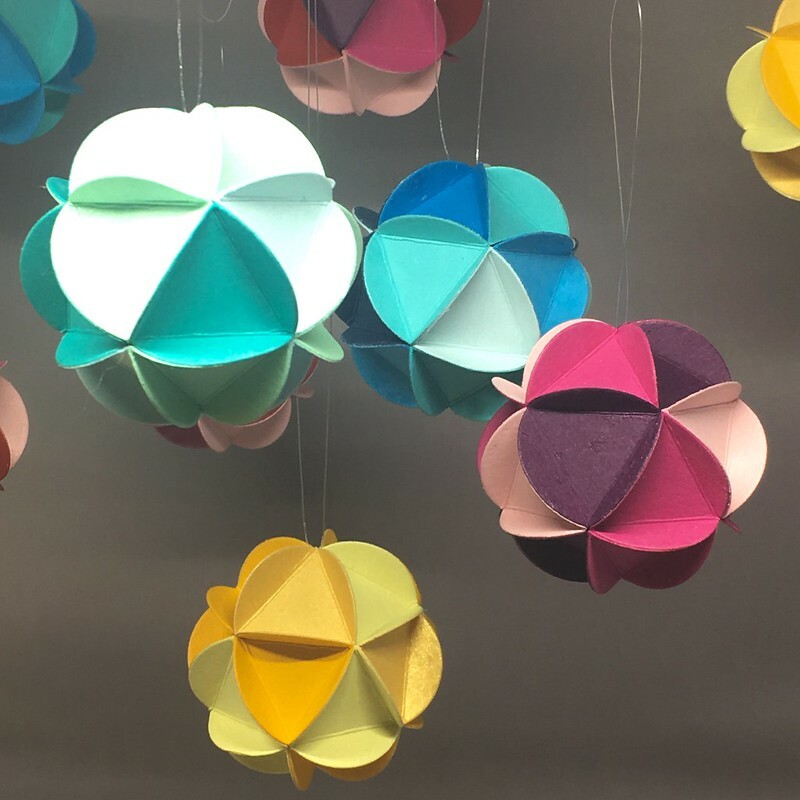 Despite how complex the end result looks, these are pretty easy to put together once you get the hang of it – and Altenew gives easy instructions to follow. Although, I did put in a lot of hours making these! It was relatively slow going. I added each ornament to my little mason cookie jars and packed them up! 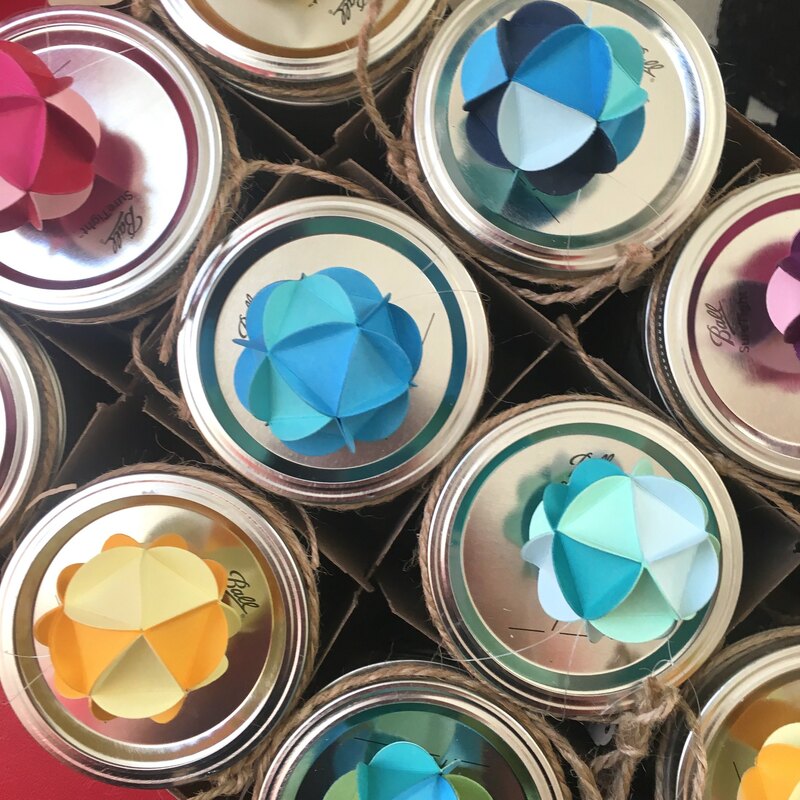 They looked so cute and colorful all packaged up and ready to head to work. 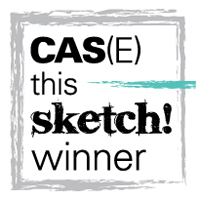 Now to start thinking about what I’m going to make next year….! I hope everyone is enjoying the holiday season so far! 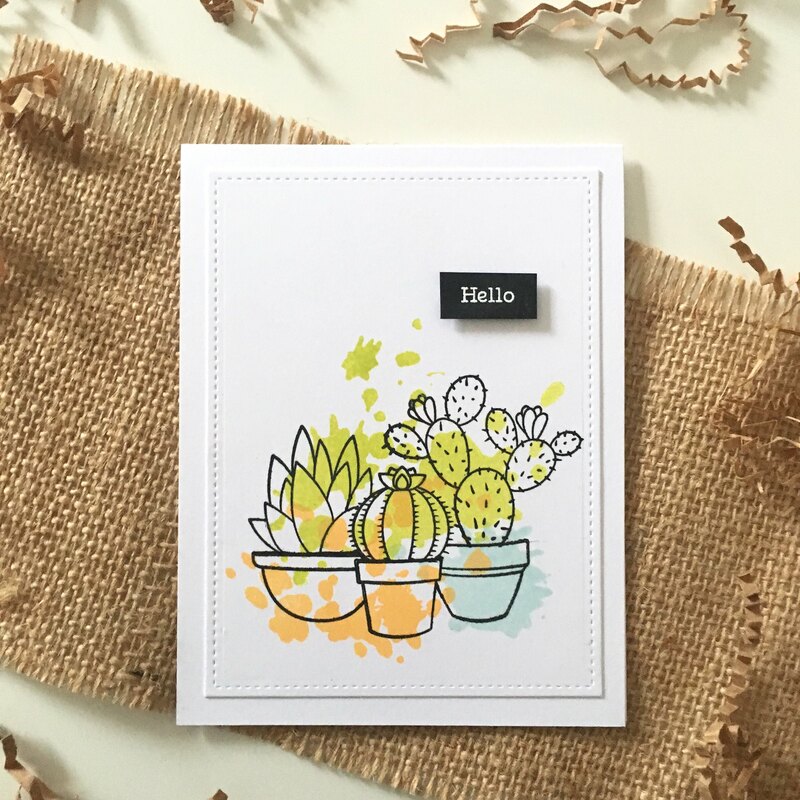 Today I’m posting a card set that has absolutely nothing to do with Thanksgiving or Christmas or New Years! Oh, well. I still love these! 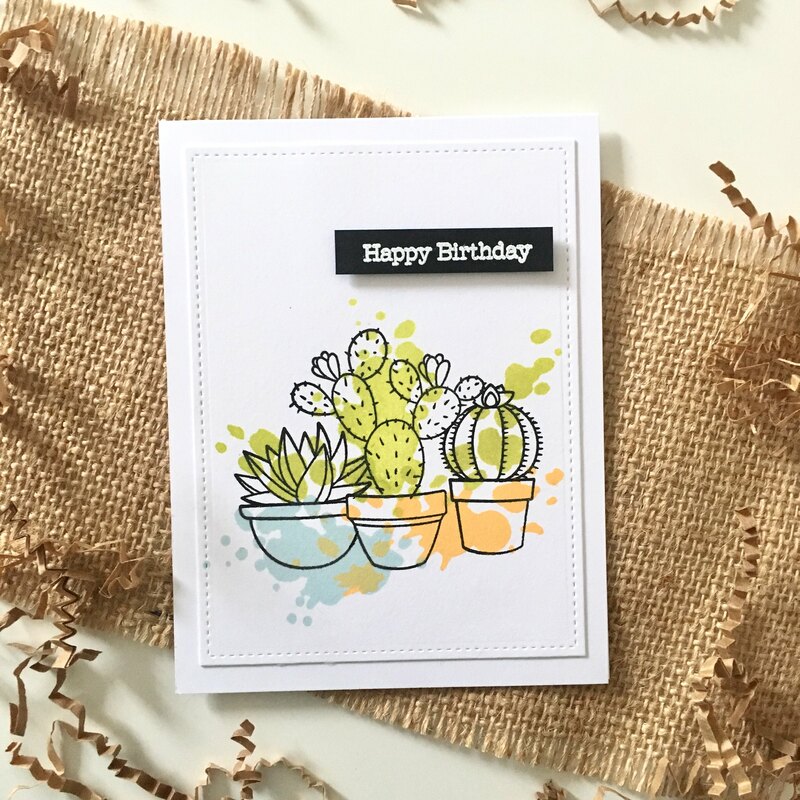 I took inspiration for this card set from a card that Therese Calvrid made using succulent stamps (I used MFT Sweet Succulents for mine) and Altenew’s A Splash of Color Stamp set. I loved the color scheme she chose, too, so I tried to emulate that as well. 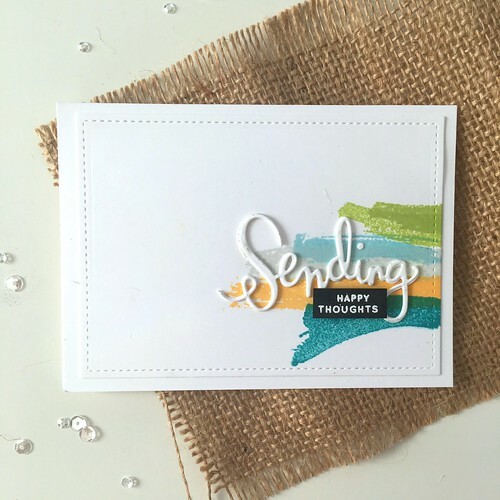 After stamping, and masking, and stamping my images, and then stamping some ink splatters on top in various colors, I got to work on my sentiments, which I heat embossed in white on black paper. I then added them to each card with some foam tape to give a bit of dimension. 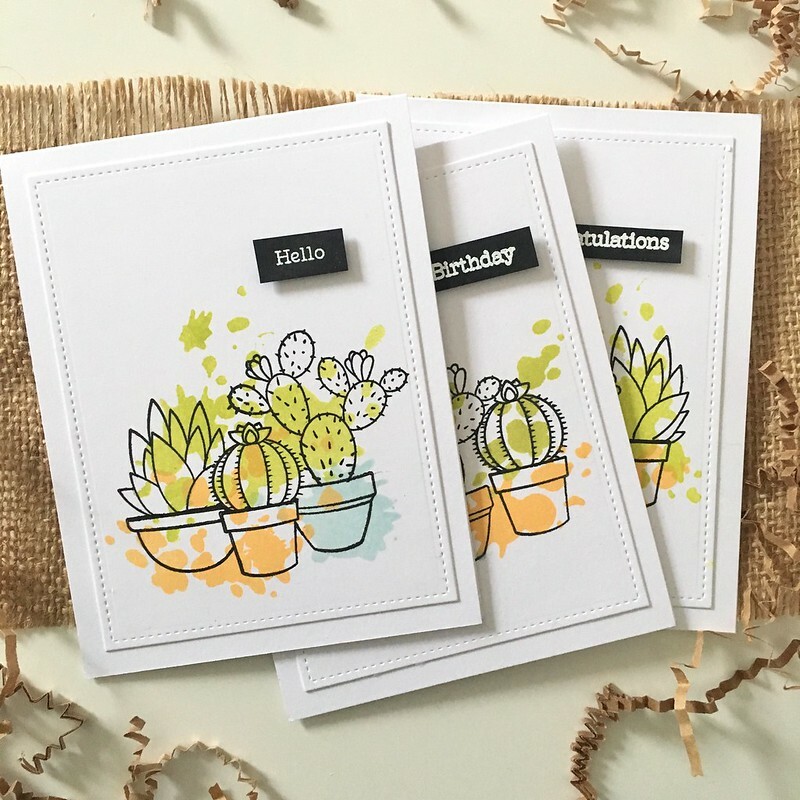 The sentiments came from the same Sweet Succulents stamp set. I love how the boldness of the sentiment contrasts with the rest of the color scheme. 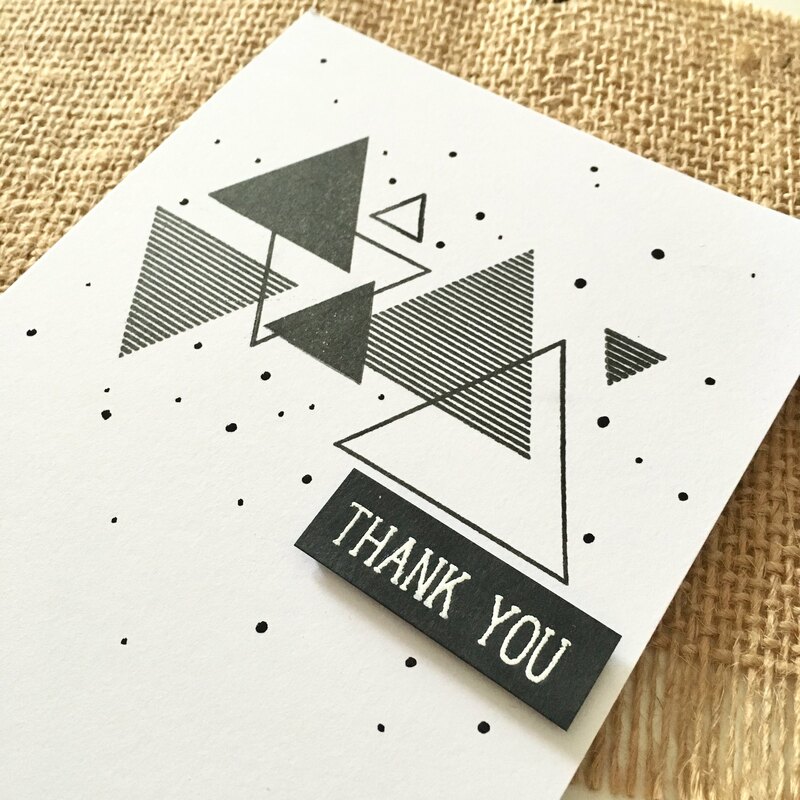 Just popping in to share a quick post today of a one-layer thank you card. For this, I used a new favorite stamp set: Sohcahtoa from Altenew. I have a thing for triangles, so this set really does it for me! 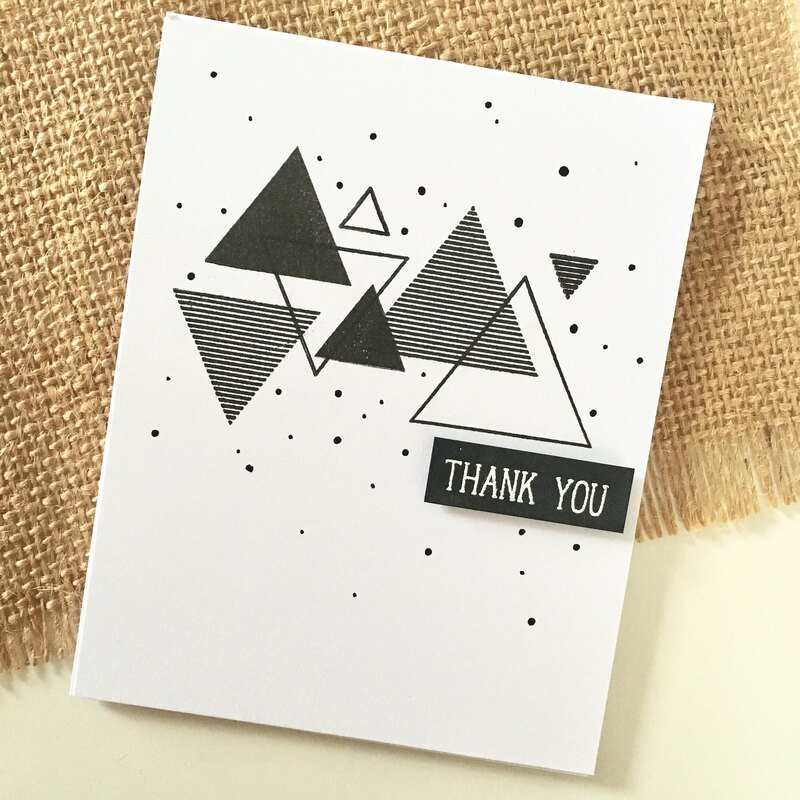 I wanted to keep the card really graphic, so I kept with a black and white theme – stamping my images with VersaFine Onyx Black ink in a random (but visually pleasing!) pattern. 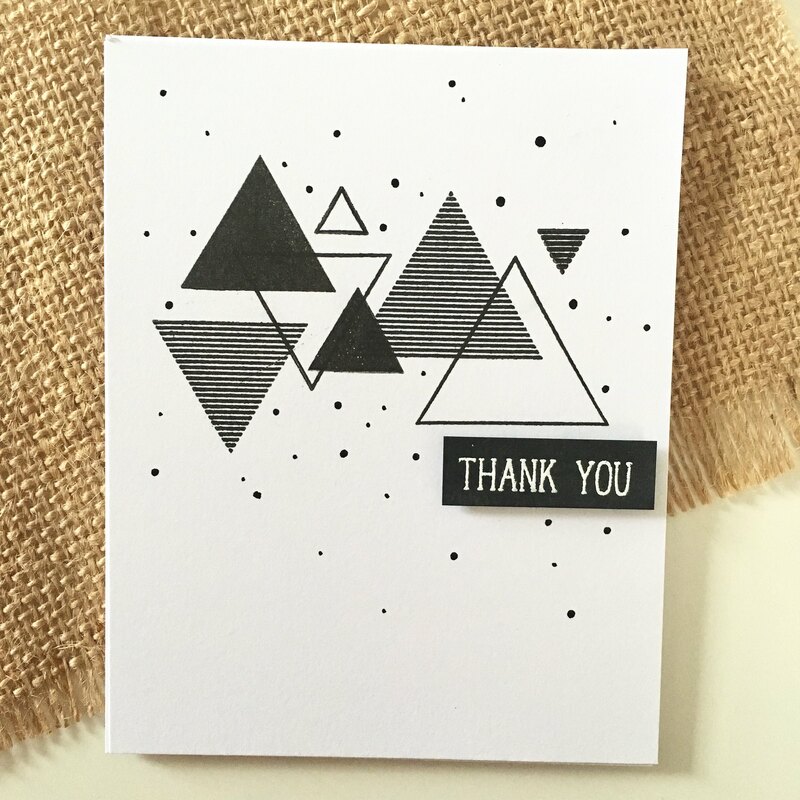 I then added a sentiment, embossed in white on black cardstock. As a finishing touch, I used my Pico Embellisher in Tuxedo Black to add some dots here and there. I made a few of these in other colors, but so far I like the black and white best. I’ll keep experimenting, though! I made this card some time ago, and totally forgot to share it here! And I haven’t been especially creative in the past few weeks, so here we are. Hopefully I can get back to my craft room soon! I miss it. 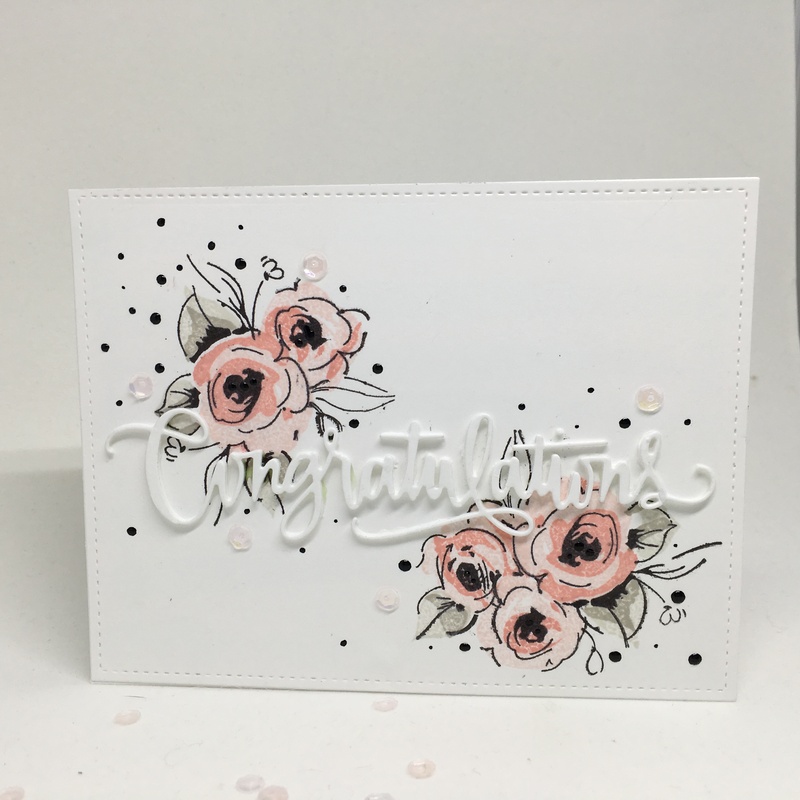 For this card, I stamped several floral clusters in each corner of the panel, using the Painted Flowers stamp set from Altenew. I used masks to arrange the clusters so that my flowers could overlap, and used several colors of ink as well. 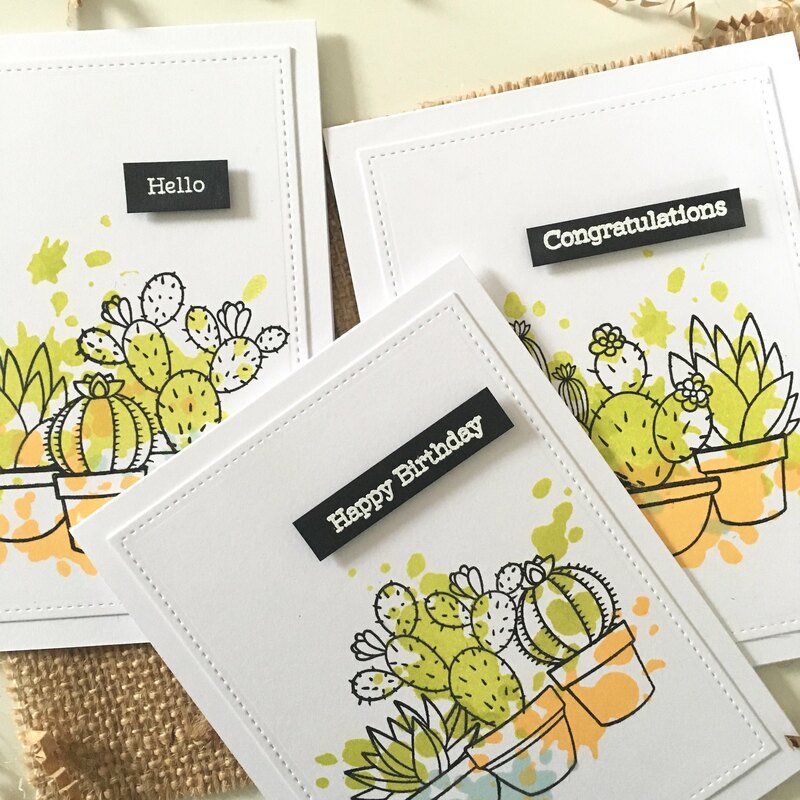 So many Altenew stamp sets make it so easy to build images with multiple layers in multiple colors. 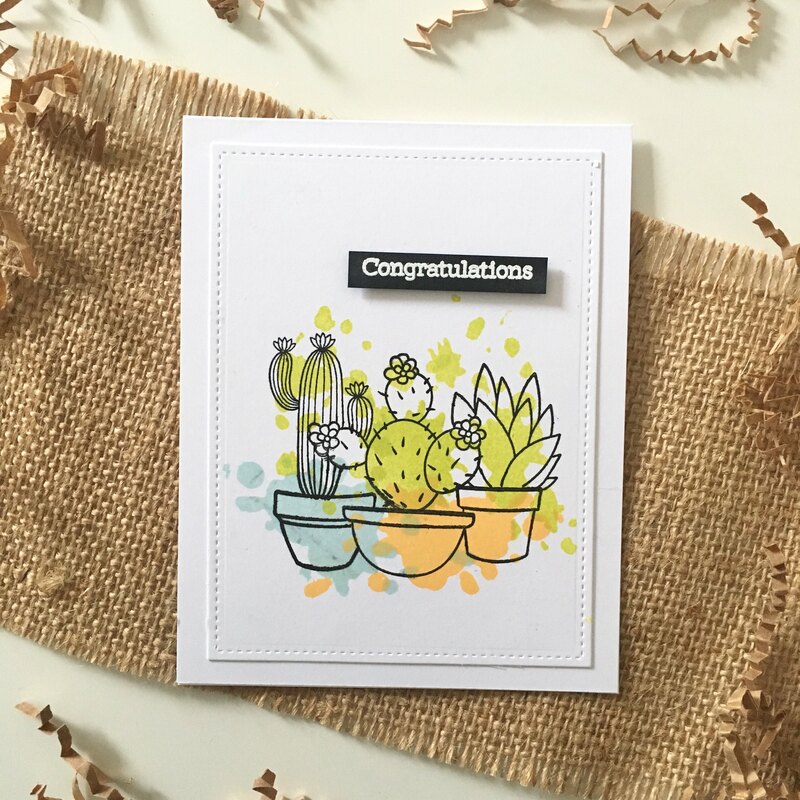 I then die-cut the Congratulations sentiment from several pieces of white card stock and glued each layer together to give the word some dimension. I adhered that to the panel with multi medium matte adhesive (this is a good option for delicate die cuts because the glue dries matte, so you don’t have to be too worried if it ends up somewhere it doesn’t belong). 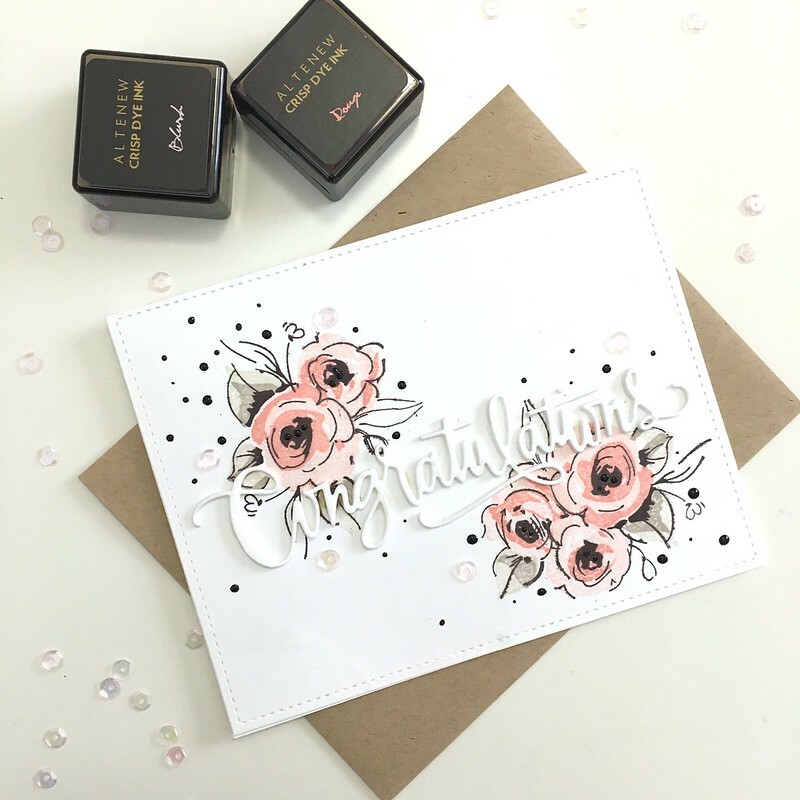 I felt like the card could use a little more oomph, so I added some black dots with a Pico Embellisher in Tuxedo Black and then some soft pink sequins as well. I like how she turned out.